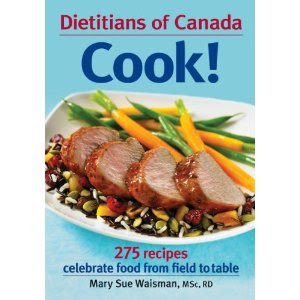 The new Dietitians of Canada Cookbook...featuring a recipe by yours truly! Available in my Amazon store. This week, I want to appeal to the adventurer in you...your mission this week is to try a recipe that you have never tried before. Whether you hoard cookbooks that you rarely use (like me) or think that a big cooking day is boiling pasta, it is time to be bold. Make the effort. You can make something elaborate or search for a 30 minute meal that will help you survive the weeknight dinner crush. It is up to you: choose a recipe, shop for the ingredients, make something fantastic and have fun! Life is busy; the effort involved in planning a meal with multiple ingredients can seem daunting but once you have mastered a recipe it becomes part of your repertoire and effortless to enjoy on a regular basis. Also, when you get stuck in a rut, healthy eating becomes boring. Way more boring than ordering a pizza. Weekends are the perfect time for a culinary adventure. You have got the time to browse recipes over morning coffee, make a shopping list and maybe even check out a farmer's market without the stress of trying to decide on how you are going to get dinner on the table after work. So crack open one of your dusty cookbooks or browse online for a recipe...I know you are tempted to skip this week because "it isn't as important" as eating blueberries but believe me, I have your best interests at heart. Cooking is a critical skill for eating well and trying something new is important for keeping healthy eating fresh. Get Cooking...let me know how your culinary adventures went! The perfect way to start eating better for sure and the only way to really know what you are eating and the quality of the ingredients. well as an undieter i thought i'd uncook as well! my new recipe: raw coconut cream pie! crust was macadamia nuts, hemp hearts and dried coconut with some honey and salt, the filling was irish moss, young coconut meat, agave nectar, banana and vanilla. delish!!! Sounds fantastic! I love coconut. There cannot be too much coconut...did you dehydrate the crust or just chill it?